Americans build wealth as they age, and this pattern of accumulation has been similar over three decades of U.S. Survey of Consumer Finances data collected by the Federal Reserve. In the chart below, net wealth is expressed in terms of annual incomes for ages 20 through 64; for example, someone with $150,000 in wealth and $50,000 in income has a wealth-to-income ratio of 3. Net wealth equals financial assets such as 401(k)s and housing, minus debt and mortgages; income includes employment earnings and investment gains. This measure does not include Social Security or defined benefit (DB) pensions. 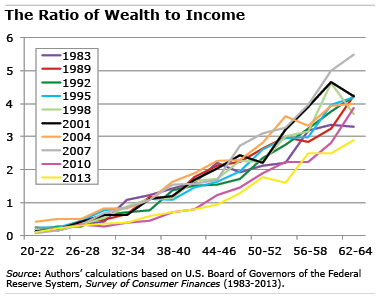 The stability of this wealth-to-income ratio over 30 years may, at first glance, be comforting. But it shouldn’t be – wealth should have increased during this time for five reasons. 1. Longer life spans than in the early 1980s require that Americans save more to fund more years in retirement. Excluding the health insurance premiums paid by employers and employees from workers’ taxable earnings is the federal government’s largest single tax expenditure, amounting to some $250 billion a year in lost revenue. Eliminating the exclusions – as some in Washington have proposed – would sharply increase how much is taken out of workers’ paychecks for payroll taxes and for income taxes. But any such proposal would also put more money in their pockets when they retire by increasing the earnings base on which their Social Security benefits are calculated. Urban Institute researchers Karen Smith and Eric Toder recently estimated the policy’s impact on workers’ taxes and benefits and found that it varied widely for different income groups and among people born in five different decades, the 1950s through the 1990s. Their analysis took into account the myriad idiosyncrasies of the U.S. tax code, including a regressive payroll tax, a progressive income tax, Earned Income Tax Credits paid to the lowest-wage workers, and the cap on payroll taxes for the highest earners. To evaluate the proposals’ impact, the researchers added the premium amounts paid by both the employer and employee to workers’ taxable incomes – just as the deficit reduction proposals would do. U.S. workers have a long list of reasons, many of them legitimate, for why they can’t come up with the money for a retirement savings plan. But here’s the rub: we live in a 401(k) world. Workers who aren’t convinced of the urgency of saving should listen to people who have already retired. Even though many current retirees have defined-benefit pensions, they have become largely unavailable to most people still working today. And these retirees say they’ve learned the hard way that saving is key. Excuses now and regrets later – these two takeaways came out of a nationally representative survey of workers and retirees by HSBC, a global financial institution. Saving for retirement is not a major priority for 81 percent of the workers surveyed. 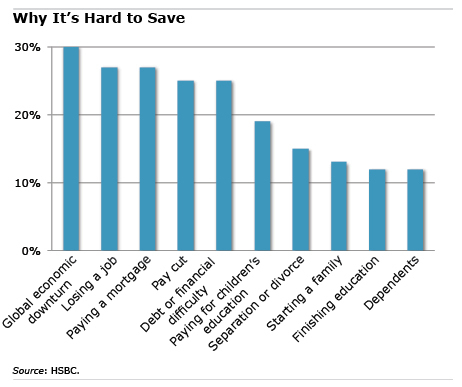 The chart shows that saving takes a back seat to myriad other financial concerns, topped by the impact of the global economic downturn and the U.S. job market.